The history of CFB Comox tells of the West Coast’s strategic landscape and Canada’s defence strategies dating back to 1942. Under the steady gaze of the Comox Glacier, looking east to the Strait of Georgia, the airfield at Canadian Forces Base Comox stands prominently in the landscape. Pitched along the ocean in the strait that separates Vancouver Island from the southwestern mainland, the location was selected by the Royal Air Force in 1942 to guard against any possible threat to North America’s west coast. The airfield was officially constituted as a Royal Canadian Air Force (RCAF) aerodrome on May 1, 1943, becoming RCAF Station Comox. The RCAF used Comox to train crews of transport aircraft, flying the C-47 Dakota, for the rest of World War II. 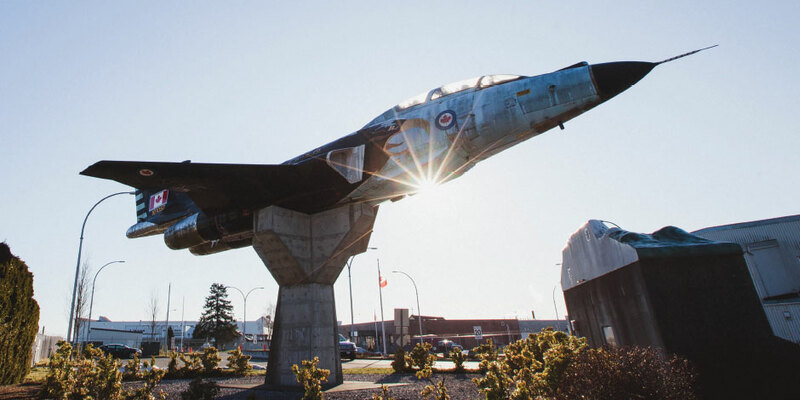 In January 1946, RCAF Station Comox was closed and placed under a care and maintenance program under the direction of the Department of Transport, but by June 1952, Comox was reactivated as an Air Defence Command establishment. Between 1954 and 1964 an extensive modernization program took place. Several new buildings, including a new large hangar, were built, and the main runway was extended to its present length of 10,000 feet. That hangar is still in use, home to the station’s first operational squadron. Dubbed “The Demons,” 407 Maritime Patrol Squadron was reactivated on July 1, 1952 and equipped with Lancaster bombers modified for anti-submarine warfare, reflecting tensions from both the Korean and Cold Wars. The squadron would go on to operate the Lockheed P2V Neptune, followed by the Canadair CP-107 Argus, and is currently providing long-range patrols of Pacific waters with the CP-140 Aurora. The station was nearly five kilometres north-northeast of Comox, so in 1953, the first 150 units of permanent married quarters were completed and occupied, while an elementary school for children of RCAF personnel was established with classrooms for kindergarten to grade six. By 1968, the present-day 442 Transport and Rescue Squadron was moved to RCAF Station Comox, and the RCAF merged with the Royal Canadian Navy and the Canadian Army to form the unified Canadian Armed Forces. The station was renamed Canadian Forces Base Comox. Operating over mountainous terrain and water, 442 Squadron started with the Piasecki H-21 helicopter, later re-equipping with the CH-113 Labrador, and onto the well-known CH-149 Cormorant in 2001. The squadron is now awaiting delivery of a new fixed-wing Search and Rescue (SAR) aircraft—the Airbus CC-295—to replace the CC-115 Buffalo, and Grumman Albatross before that. By August 1974, all military flying activity in British Columbia was consolidated at CFB Comox, and the following year the command structure changed to reflect the origins of present-day operation. The strategic selection of the location made in 1942 proves relevant nearly 80 years on, as CFB Comox is the primary air defence installation on Canada’s Pacific coast, serving as the home base for long range patrol and search and rescue operations.